Here is another effort to unpack how the wind industry has begged and bullied its way – all over the world – to a obtain a rigged set of utterly meaningless noise ‘rules’, that allow wind power outfits to get away with murder. Damage to their health, due to lack of sleep and peace of mind. Living with closed windows and doors, due to year-round noises. The wind turbine noise problem is worldwide. Due to a lack of worldwide guidelines, various political entities have been developing their own codes for the past 30 years. The World Health Organization is finally addressing the lack of detailed guidelines regarding such noises. World Health Organization Noise Guidelines: WHO, publishes detailed guidelines regarding various, everyday noises, such as near highways and airports, within urban communities and in work places. The guidelines serve as input to local noise codes. In general, wind turbines are located in rural areas. When they had low rated outputs, say about 500 kW in the 1960s and 1970s, they made little audible noise, and the infrasound was weak. However, when rated outputs increased to 1000 kW or greater, the audible and infrasound noises became excessive and complaints were made by nearby people all over the world. WHO, which has not published any detailed guidelines regarding wind turbine noises, will be releasing environmental noise guidelines for the European region in the near future. The maximum outdoor dBA value, how that value is arrived at, such as by averaging over one hour, where that value is measured, such as near a residence, or at the resident property line to enable that resident to continue to enjoy his entire property. How to measure, or calculate the outdoor-to-indoor sound attenuation of a residence. How much setback is needed, such as one mile to minimize infrasound impacts on nearby residents. The maximum dB value of infrasound, how that value is arrived at, where that value is measured. How to determine the need for a 5 dB annoyance penalty. The lack of such guidelines has resulted in various political jurisdictions creating their own codes. That process has been heavily influenced by well-financed, pro-wind interests, which aim to have the least possible regulation to maximize profits. Page 4, par 5.1.1 mentions averaging over various periods. Only the worst average readings of a period are to be considered for compliance. Page 4, par 5.1.2 mentions a 5 dB annoyance penalty must be added to the worst average readings for a period for clearly audible tonal and impulse sounds with frequencies greater than 160 Hz, which would apply to wind turbine sounds. Page 6, par 5.4 mentions limits for indoor A-weighted low frequency noise 10 – 160 Hz, and G-weighted infrasound 5 – 20 Hz. “If the perceived noise contains either clearly audible tones, or clearly audible impulses, a 5 dB annoyance penalty shall be added to the measured equivalent sound pressure level” That means, if a measured outdoor reading is 40 dBA (open country, wind speed 6 m/s), and annoyance is present, the reading is increased to 45 dBA, which would not be in compliance with the above-required 42 dBA limit. In some cases, a proposed wind turbine plant would not be approved, because of the 5 dB annoyance penalties. The noise of wind turbines varies up and down. The annoyance conditions associated with wind turbines occur year-round. The annoyance conditions associated with other noise sources usually occur much less frequently. NOTE: The 5 dB penalty does not apply to indoor and outdoor low frequency and infrasound noises, i.e., 160 Hz or less. – For both categories (dwellings, summer cottages, etc. ; open country), the mandatory limit for low frequency noise is 20 dBA (Vermont’s limit is 30 dBA), which applies to the calculated indoor noise level in the 1/3-octave bands 10 – 160 Hz, at both 6 and 8 m/s wind speed. The purpose of the regulation is to ensure neither the usual noise, nor the low frequency noise, will annoy nearby people when the wind turbines are in operation. Denmark’s Controversial Noise Attenuation Calculations: The controversy in Denmark is regarding the Danish EPA assuming high attenuation factors for calculating attenuation from 44 dBA (outdoor) to 20 dBA (indoor, windows closed) for frequencies above 63 Hz, which yield calculated indoor noise levels less than 20 dBA. The Danish EPA prefers assuming high factors, because they result in compliance, which is favorable for wind turbines. However, acoustics engineers have made indoor field measurements (supposedly “too difficult to measure”, according to the Danish EPA), which indicate many houses near wind turbine plants have lower than assumed attenuation factors, which results in indoor noise levels greater than 20 dBA, i.e., non-compliance, which is not favorable for wind turbines. However, the final arbiters should not be government personnel using assumptions, but the nearby people. Increasingly, those people are venting their frustrations at public hearings and in public demonstrations. 2) POLAND is considering a proposed a law with a 2.0 km (1.24 mile) buffer zone between a wind turbine and any building. That means at least 65% of Poland would be off limits to wind turbines. Future wind turbine plants likely would be offshore. 3) BAVARIA, a state in Germany, just enacted a setback of 10 times turbine height, i.e., 10 x 500 ft = 5,000 ft, almost one mile. In Germany, the wind turbine nighttime noise limit is not to exceed 35 dBA. The second URL shows what happens when it is sunny and windy in Germany. The excess energy is dumped onto connected grids at near-zero wholesale prices. This has been happening more and more hours of the year. 4) LETCHER TOWNSHIP, South Dakota, voted for a 1-mile buffer zone. Under the approved ordinance, no large wind turbine plant could be built within 5,280 feet of the nearest residence of a non-participating homeowner, or within 1,500 feet of the nearest neighbor’s property line. Shadow Flicker: A shadow-flicker assessment must be completed for each residence, learning space, workplace, health care setting, public gathering place (outdoor and indoor), other occupied building and roadway, within a minimum of 1 mile of any turbine, based on shadow flicker modeling that assumes an impact distance of at least 1 mile from each of the turbines. Shadow flicker may not occur more than 8 hours per year at any of these locations. Setbacks: The applicant must complete an assessment of the risks of ice throw, blade shear, tower collapse on any property, roadway, etc. A committee will determine, on a case-by-case basis, whether there is a concern with the setbacks and/or the appropriate distance that should be set. In 2012, the Maine Board of Environmental Protection adopted noise control regulations that are specific to wind turbine plants. Maine DEP Chapter 375.10(I) of Maine DEP regulations specifies sound level limits for wind turbine plants as 55 dBA from 7am – 7pm (the “daytime limit”), and 42 dBA from 7pm – 7am (the “nighttime limit”) averaged over one hour, at protected locations. Within 500 feet of a residence on a protected location or at the (project) property line, if closer to the dwelling. The resulting sound levels at a residence itself are usually lower than at 500 feet from the dwelling or at the property line where the 42 dBA “nighttime limit” applies. Beyond 500 feet, the daytime limit of 55 dBA applies 24 hours per day. Maine DEP Chapter 375.10 noise rules establish sound level limits on an hourly basis although compliance for wind turbine plants is evaluated by averaging sound levels over twelve or more ten-minute measurement intervals with turbines operating at full-rated sound output. There are also special provisions and “penalties” that apply when the sound generated by a wind project result in tonal or short-duration, repetitive sounds. This standard is described in more detail in the remainder of this report. See URL. Maine DEP Chapter 375.10, Section I, requires a 5 dB annoyance penalty be added for certain occurrences of tonal and short duration repetitive (SDR) sounds when determining compliance with hourly sound level limits. 7) VERMONT has an ad hoc wind turbine code , i.e., applied on a project-by-project basis. The code allows a maximum noise of 45 dBA (outdoor), averaged over one hour, as measured at a nearby residence. The averaging makes disappear random noise spikes of 60 – 70 dBA, which disturb the sleep of nearby people. The code allows a maximum noise of 30 dBA (indoor, windows closed), averaged over one hour. The code makes no distinction for daytime and nighttime, even though people may want to have open windows, especially during warm nights. Vermont’s code has: 1) no required buffer zone; 2) no required infrasound limit; 3) no 5 dB annoyance penalty; 4) the indoor limit is 30 dB, whereas the Denmark limit is 20 dB. In Vermont, residences cannot attenuate 45 dBA (outdoor) to 30 dBA (indoor, windows closed), according to acoustics tests. See URL. NOTE: If Denmark’s residences cannot attenuate 44 dBA (outdoor) to 20 dBA (indoor, windows closed), and Vermont residences cannot attenuate 45 dBA to 30 dBA (a much easier requirement), then the options are: 1) have lesser capacity wind turbines; 2) locate them further away from residences, i.e., a greater buffer zone; 3) upgrade the attenuation of nearby residences; 4) buy out the owners. The Vermont code is much less strict than of Denmark and New Hampshire, largely because of the political influence of RE special interests. Five years ago, the Vermont Public Service Board could have copied major parts of the Danish code to create a Vermont code that actually protects nearby people. Measuring Wind Turbine Sounds: This article describes in detail some aspects of measuring wind turbine sounds. Everyday noises in the audible range are weighted using a curve that approximates the response of the human ear. See figures 1 and 2 of article. If the A-curve is applied to sound measurement dB readings, they are designated as dBA. The dB levels of frequencies below about 200 cycles per second, i.e., 200 Hz, are artificially lowered, due to the A-curve application. That includes infrasound frequencies of 20 Hz, or less. See figure 3 of article. The site background noise is affected by wind speed. At near zero wind speed, as often occurs in rural areas at night, the noise is about 10 to 15 dBA. See figure 4 of article. Outdoor-to-indoor attenuation of infrasound below 4 Hz is near zero for a wood-frame house 1,300 meters (4,265 ft) from a wind turbine. See figure 8 and 9 of article. Whereas a resident would not hear such noises, they would create significant physical discomfort, such as nausea, headaches, dizziness, etc., if the noises were strong, i.e., have high dB values. Figure 11 of the article shows a similar lack of outdoor-to-indoor attenuation of infrasound for a house 8,000 meters from a wind turbine. The conclusion is: Infrasound below 4 Hz travels long distances and is very little attenuated by a wood-frame house. Infrasound: Sounds with frequencies of 20 Hz, or less, are defined as infrasound. Those sounds are not heard, but felt. A rotor blade passing the mast of a wind turbine creates a burst of audible and inaudible sound of various frequencies. The base frequency is about one cycle per second, similar to a person’s heart beat, and the harmonics, at 2, 4 and 8 Hz, are similar to the natural frequencies of other human organs, i.e., ears, eyes, liver, kidneys, etc., which start vibrating. The natural frequencies of wood-frame house walls are less than 20 Hz. The infrasound induces them to start vibrating, which creates standing, inaudible air pressure waves inside the rooms of a house. As a result, nearby people find life inside their houses unbearable. Often they abandon their houses, or sell at very low prices. Infrasound interferes with the body’s natural biorhythms, and causes adverse health impacts on nearby people and animals, including DNA damage to nearby pregnant women and animals, their fetuses, and newborn offspring. See URLs. Infrasound travels long distances. A buffer zone of about 1 mile is required to reduce adverse impacts on people. However, roaming animals would continue to be exposed. Acoustics consultants usually deal with OSHA-type measurements of everyday noises. Most of them have almost no experience measuring infrasound, which requires special instrumentation and test set-ups. As a result, acoustics consultants take the easy way out by claiming infrasound does not exist. That measurements of low frequency noise are made to look less on an A-weighted basis helps their argument. If acoustics consultants admit infrasound does exist, they provide a list of studies proving it does no harm. To which opponents reply with a list of studies that state it does harm to nearby people. Some governments have used infrasound as a non-lethal weapon for torture or crowd control. It leaves no marks. The Need for a 5 dB Annoyance Penalty: Rural nighttime ambient noise is 20 – 40 dBA, and urban residential nighttime ambient noise is 58 – 62 dBA. In many rural areas, nighttime outdoor ambient noise averages about 20 dBA. People who live in urban areas have no idea how quiet it is in rural areas. For example: the introduction of clusters of 3 MW wind turbines, on 2,000-ft ridgelines in New England, came as a total shock to nearby rural people. Being high up, the noise carries far, especially the infrasound. The dB values to indicate noises are a proxy for sound pressure level, SPL. The ears of people are sensitive to sound pressure. The below table clearly indicates random noise spikes above 50 dB have high SPL values, which are highly disturbing to nearby people, especially at night. Any wind turbine noise guidelines and codes must be based on rural noise values. A 45 dB noise has an SPL 5.6 times greater than a 30 dB noise; 17.8 times greater than a 20 dB noise. A 63 dB random spike has an SPL 44.9 times greater than a 30 dB noise; 142 times greater than a 20 dB noise. * The commonly used reference sound pressure in air is 20 micro-pascal. It is considered the threshold of human hearing (roughly the sound of a mosquito flying 3 m away). General Comments: As almost all recently installed wind turbines are rated at 2 – 3 MW, and as almost all such units are in rural settings, government noise codes should use the rural nighttime ambient noise level as the basis for limiting wind turbine noises. Ever-present, random spike noises, with higher dB values, say 60 – 70 dBA, can occur, during an hour, but the “averaging over one hour” makes these noises disappear; hence the reason for Denmark, Maine, etc., having a 5 dB annoyance penalty. These peak noises are most annoying, they occur at random, and mostly at night. They adversely affect the health of nearby people. As a minimum, they deprive nearby people from getting a good night’s sleep to recover from the prior day, and to get ready for the next day. According to WHO, restful sleep is a basic requirement for good mental and physical health, as are food, water, air, etc. Denmark holds infrasound is harmful to the health of nearby people and animals. Therefore, it has an infrasound requirement in its wind turbine code. This advice and the chart, prepared by Rand and Ambrose, two prominent acoustics engineers, which shows Vermont’s noise limit. Hi from Oz. I have previously mentioned in other forums that the required measurement device (an acoustic sound level meter) referred to in many of the various countries’ wind turbine noise rules are designed to measure sounds only in the audible range – i.e. about 20 to 20,000 Hz (aka cycles per second). These devices, which as a former government employee I have used to officially measure aircraft noise levels, have filters which sharply cut off sounds outside this range. As I have also seen several charts which show that commercial wind turbines generate a large proportion of their ‘sound’ output as infrasound (i.e. below 20 Hz), the requirement to use an instrument that is designed NOT to measure infrasound to measure wind turbine ‘noise’ is bizarre, if not fraudulent against those claiming to be suffering from the effects of the turbine infrasound. 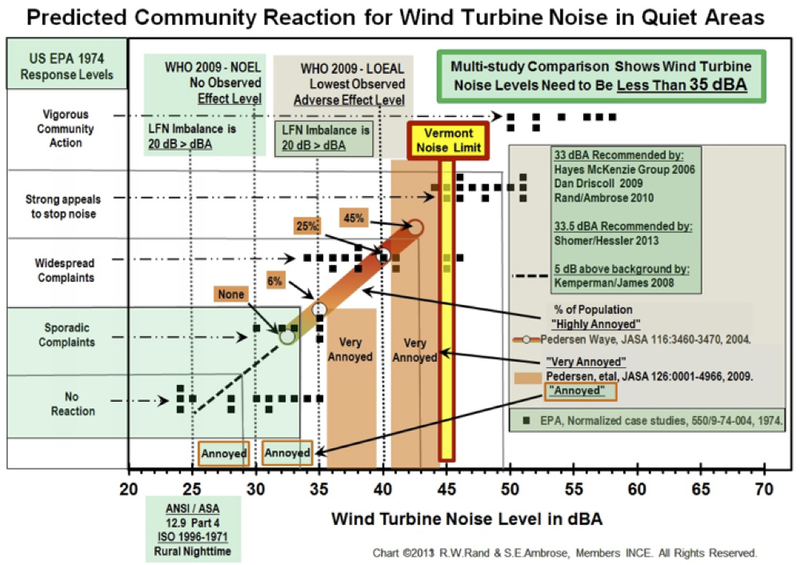 There is no way a standard ‘noise’ level can be assigned to a Wind Turbine installation. Each and every Turbine – not only the turbine project needs to be assessed before installation. It is also then necessary for an assessment of the combined project as a whole to be assessed for its ability to NOT cause disturbance to anyone no matter the distance from homes or other buildings or work places. Distances alone are ineffectual to assess the chance of disturbance. Environment, geology etc also has to be accounted for. Also every aspect of these things needs to be assessed for their ability to issue noise, vibration, shadow flicker and any other annoyance before they are even considered to be installed anywhere. As well as their ability to produce the level of energy each projects proposed installed capacity states it can do. This cannot be decided by a wind mast, each turbine and its proposed location has to be assessed. Each of these things will have an impact on what disturbance each turbine and the combined project will issue. WHO is only interested in providing any help via ‘guidelines’ to Europe where does the word “WORLD’ come into their role – it seems to have disappeared. Europe is not Australia, or anywhere else. I am still confounded by the fact WHO and other authorities still consider these things are useful – installed capacity is nothing to go by as it requires a constant output at a very high level – this NEVER happens – yet these things are causing so much pain to people and creatures and damage to the environment and eco-systems, and this is not yet officially recognised – how much longer does this farce have to continue before a stop is called to this industry. Maybe a concerted Worldwide letter/email/submission etc campaign by all those living with the dangers and damage from industrial wind turbines, to members of the Assembly, to see if they can be woken up to their duty of care to all. I agree that a “concerted worldwide…campaign” is in order. 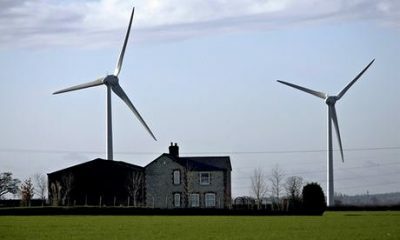 If that doesn’t work to shut these turbines off, then we can conclude that the statement regarding ‘weapon of torture’, enclosed in this article is true now and rural residents throughout the world are the victims.. The next step would be a massive criminal investigation of all who are responsible for not protecting rural residents from industrial scale wind turbines. Forced relocation is absolutely unacceptable! Who has access to the email addresses of people in rural communities around the world? Networking and large scale collective cooperation is challenging but crucial. How much more suffering will need to come to light before action is taken? Remember to keep an eye on http://www.windsofjustice.org.uk for updates on windpower matters. Please find link below to a recent talk given by Mariana Alves Pereira. Apologies if STT have posted this already (Or are indeed about to). It is just so interesting. Having met Mariana, I have to say that she is one remarkable person. Thank you Mariana. We shall be watching your work extremely closely. We experience the infrasound where I live and the whole thing is extremely worrying, especially as no-one in the Government will admit it is happening.